Going vegan is one monumental step in becoming a greener citizen of Earth. You eliminate your contribution to factory farming runoff, greenhouse gases, and rainforest deforestation. You take up eating plant-based foods, and a ton of them as a way to help animals, the environment and your health. Then one day as you’re in the kitchen cutting open those finally ripe avocados to make your chocolate avocado pudding it hits you, you’ve got a ton of food scraps daily that end up in the trash. You’ve heard about composting but don’t know how to start composting or really what the benefits are. Composting is relatively easy and you can be as involved or hands-off as you want it to be! Composting is a fantastic solution to reduce our carbon footprint and create healthier, more nutrient-rich gardens. The Environmental Protection Agency estimates that our food scraps and yard waste account for roughly twenty to thirty percent of what we throw away. Diverting this waste from the landfill reduces methane emissions and ensures us a free source of high-quality soil. The keys to having a successful compost pile include using the appropriate materials in the right ratios, keeping the pile aerated, keeping the pile moist, and making it easily accessible. What exactly constitutes compost and how is it made? Compost is decaying organic matter that turns into nutrient-rich soil (see below for complete list). Essentially, compost mimics natural recycling in a smaller, more controlled fashion. Compost consists of only biodegradable materials, known as greens and browns. It’s significant to note that if you intend to use the compost to grow food, what you compost will make up the soil you use to grow your food, so nontoxic, organic scraps equal nontoxic, organic compost. The greens are the moist, nitrogen-rich kitchen scraps, and yard clippings that go into your compost. The browns, are the dry, carbon-rich leaves, straw, paper, and twigs. This combination of matter is crucial to create a healthy soil that can help plants become more disease resistant, more pest resistant and have a higher nutrient content. The greens and browns work most efficiently when mixed together in a ratio of two parts greens to one parts brown. This mixture, when aerated assists bacteria, fungi and other microorganisms, as well as worms and other insects, break down the matter. If all goes well, eventually you get a deep black, nutrient-rich soil. How to make compost may seem relatively easy. Take waste, put it in a pile and nature adds a little magic and voila, compost right? Not exactly. Composting is relatively easy but has quite a learning curve. 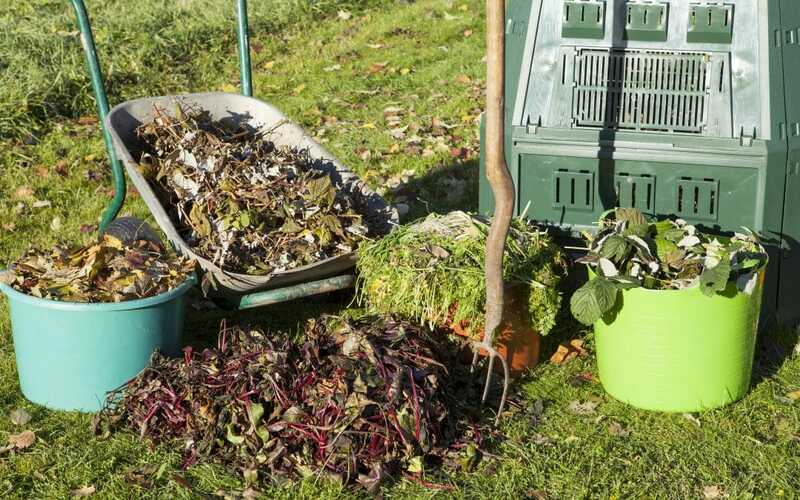 All composting begins with a pile or bin that you can either fill as items become available or begin by filling your container mostly full of a lot of greens and browns at once to make a larger batch more quickly. One important factor to bear in mind is that much of the work you do in composting is to keep the beneficial microorganisms alive and doing their job of breaking down the organic matter. The bacteria that do much of the work are aerobic decomposers, meaning simply that they require oxygen to break down the matter, which in turn heats up the temperature. These bacteria are why aeration of the pile, or turning, is so important to creating compost. Turning of the pile is generally recommended at least once a week, using a shovel or garden fork and pulling the outer material inward and vice versa. Manually turning the soil assists in breaking the compost down faster by encouraging the temperature to rise in a process known as hot composting. In hot composting, this is when the compost greens and browns ratios have been paid attention to, the pile has been turned regularly for aeration, and the pile is kept mildly moist. These conditions favor the organisms breaking down the matter quickly, causing the temperature to rise and can produce compost within a matter of several weeks to several months, depending on the exact conditions. The high temperatures (no higher than 140 degrees is preferable if you want to check your pile) kill off any weed seeds and disease-causing organisms. If you are not interested in a more labor-intensive process or simply don’t need compost more immediately, cold composting is a far more hands-off option. Cold composting uses the same materials as hot composting (minus the weed seeds) but the ratios need not be paid attention to as closely, nor does it need to be turned with the same frequency, if at all. The benefit of these piles is that you still get to recycle and reuse kitchen scraps, paper and yard waste but with minimal effort. The downside to cold composting is the time it requires to break down the materials, usually requiring at least a year. Now that you know the ins and outs of composting, it’s important to pick what you will use to compost in and where you will place that. The two most common composting receptacles are either compost piles or composting bins. Compost piles can be covered or uncovered. The covered piles often are very beneficial for hot composting while the uncovered lend themselves to the more hands-off cold composting. If using a covered pile, build a wooden box with room between the slats with a removable lid. A lid is crucial to all hot composting bins to hold in the heat and is also essential if composting food scraps in an area with hungry wildlife. If just thinking of how to build a compost bin seems overwhelming, consider an easier solution, container composting. Composting can be as easy as obtaining a plastic bin, such as an eighteen-gallon container, drilling holes in the lid and putting it in your designated space, it’s really that easy. Whether you chose to build a large compost bin in your yard or use a container to compost either in your house or yard, it’s important to choose a place that is easily accessible to make composting convenient, such as right under or off a back porch. Convenience is absolutely essential when implementing a habit such as composting, especially since it relies upon your regular attention. An easy indoor option to help implement this eco-friendly habit is having a compost bowl or a countertop compost container for food scraps in your kitchen. Composting is a fun, environmentally friendly endeavor that can be as hands on or hands off as you want it to be. Composting is one small step we can take that has profound implications on the health of our planet and of our soil. When we open our minds and our hearts to veganism, we are able to enact big change in the world and we open ourselves up to becoming better citizens of our planet. By composting, we are taking further action to create a less polluted world and leave future generations with a planet that has been loved and taken care of.